William Basinski is a United States avant-garde composer of ambient music via tape music and process music. Basinski is also a clarinetist, saxophonist, sound artist, and video artist. He is best known for his four volume album, The Disintegration Loops, constructed from rapidly decaying twenty year old tapes of his earlier music. Lawrence English is writer, musician and media artist based in Brisbane, Australia. Working across a broad range of art forms, English’s work is eclectic and characterises a long-term exploration of various themes – including audio/visual environments seen in his recent installation work, ‘Ghost Towns’. 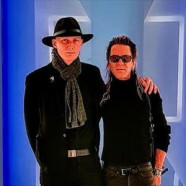 The two collaborated remotely on the 2018 album ‘Selva Oscura’.